I started Pinch My Salt in June of 2006 and although I didn’t celebrate the actual one year anniversary with a special post or a special meal, I think I should at least acknowledge the fact that yes, I have been photographing and writing about my food for over a year now! The above photo is one of my earliest attempts at food photography. As you can see, my photography has come a long way over the last year 😉 But these Cheddar, Sour Cream and Chive Biscuits are important because they were the very first original recipe posted on Pinch My Salt. No, it’s not a fancy recipe. No, it’s not a complicated recipe. It’s just something I threw together from what I had on hand because I was hungry. But they tasted good and I was proud enough of these silly little biscuits to get out my camera and photograph them. I can remember feeling the need to share that biscuit recipe because I was starting to come to a realization. Cooking does not have to be complicated or difficult or time-consuming. It seemed important to me that people realize how easy it is to create something warm and comforting in your own kitchen. Why would you want to go buy a box of biscuits at Popeye’s when you can fill your entire home with the aroma of biscuits fresh from the oven in the same amount of time it would take to go pick something up? And these biscuits may not be healthiest thing in the world but I guarantee you that they are better for you than most things you would go out and buy. And this is true of almost all food you cook at home. A meal prepared at home will almost always be healthier for you than a meal purchased at a restaurant. When you prepare something yourself, you are in charge of the ingredients. You know what you are putting in your body. But I’m getting away from my main point. I started Pinch My Salt a year ago because I wanted other people to realize what I had realized. Cooking does not have to be a chore. Now, this is easy for me to say because I don’t have the demands of cooking for a large family every day. But I truly believe that cooking can be a fun, creative outlet and anyone can do it if they are willing to start small and learn the basics. Cooking and then eating a meal at home is nourishing for the mind, body and soul. I truly believe this and I hope that I am able to convey that through my photographs, writing, and recipes. The Cheddar, Sour Cream, and Chive Biscuit recipe didn’t receive much attention when I wrote it one year ago but if you would like to revisit it and see the beginnings of Pinch My Salt, you can view the original post here. Thanks for reading! Why would anyone go to Popeye's for anything.They look delicious! Those look good, but it's pity that most of us can't get those ingredients here in Italy :) What torture!! !You'll have to make a suitable Italian-only substitute and let me know! Sara, here's a biscuit recipe from Paul Dean that uses ingredients that can be found in Europe:Basic Biscuits: 1 package yeast 1/2 cup lukewarm water 5 cups all-purpose flour 1 teaspoon baking soda 1/2 teaspoon salt 1 tablespoon baking powder 2 tablespoons sugar 3/4 cup solid shortening (recommended: Crisco) 2 cups buttermilkBiscuits: Preheat oven to 400 degrees F. Dissolve yeast in warm water; set aside. Mix dry ingredients together. Cut in shortening. Add yeast and buttermilk and mix well. Turn dough onto lightly floured surface and roll out to desired thickness. Cut with small biscuit cutter and place on greased baking sheet. Bake for 12 minutes or until golden brown. Happy 1 year anniversary Nicole! And seriously, look at the huuuuuuuge progress you have made in such a short time. I can only imagine what you are going to do after this! I am also w/Ruby on needing a dose of your website--makes my day. And..I am a reader that doesnt really cook--although I know I need to--my poor husband:) We love ya Nicole--keep up the good work!!!! Happy blog birthday! I didn't realize that you'd only been blogging for a year, you must be a quick learner! Red Lobster biscuits are better then anything, I don't care how good yours may be, Nicole. I say that now, but if you were around to make your biscuits, I might change my mind.What I really need is an in-house biscuit chef to take care of all my biscuiting needs. Happy 1st birthday to ur blog nicole. "Cooking and then eating a meal at home is nourishing for the mind, body and soul...I hope that I am able to convey that through my photographs, writing, and recipes".Yes, you do convey that, and as a budding cook, I thank you for it. Amen on eating whole foods ... 25 pounds ago I'd have said differently!And happy blogiversary! It IS fun, isn't it? Jonathan: Ok, i admit it, sometimes I eat chicken strips, mashed potatoes and a biscuit from popeye's. And then I get sick :-)Sara: I've been meaning to revise this recipe using all the separate ingredients instead of bisquick but just never got around to it! 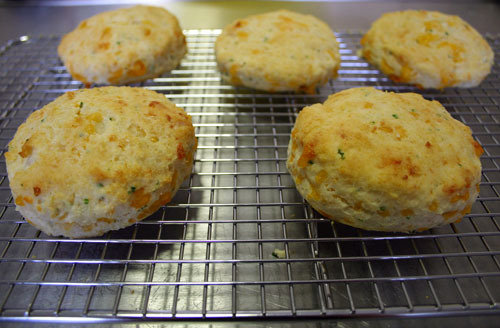 You could use any regular biscuit recipe and mix in some chives and cheddar :-) I see that Peter has shared Paula Deen's recipe.Peter: Thanks for sharing Paula's recipe! I've never used yeast in my biscuits, have you tried the recipe?Ruby: I've never been to Red Lobster so I don't know what these biscuits are that you and Jason are talking about!Steph: It's never too late to start! :-)Lisa: Thanks!Kalyn: Well I still definitely feel like a newbie! Learning more and more every day though :-)Genie: Thanks! I will have some new recipes posted soon! I just made some really good black bean dip with toasted pita chips yesterday :-)Jason: Trust me, I'm not a great biscuit maker. And these are just made from bisquick! Actually, I do normally make them from scratch and I've been known to make some good biscuits and sausage gravy from time to time :-) I don't think I've ever been to Red Lobster.Padmaja: Thanks! Now I kind of wish I had baked a cake!Mrs. L: Thanks for telling me that :-)Abby: Thanks! I really can't believe it's been a year! Nicole, I haven't tried it yet but I thought I'd offer the recipe up for the Europeans with no Bisquick. I might try it when I'm in Greece, they dig new stuff like that. Congrats on a year! Isn't it surreal to think you've been doing it this long? I have no idea where the past year went but I look forward to more of your blogging and mine!